Show of hands, who remembers Pushmo? Ok, and for those of you who don't remember, Pushmo was/is one of the acclaimed titles that was released when the Nintendo eShop service started, releasing way back in December 2011 outside of Japan. I didn't go into Mario Vs. Donkey Kong: Tipping Stars wanting to compare it to other games, but after a few hours with it you'll see why you can't play without making them. Pushmo had whimsy and inventiveness and soul! 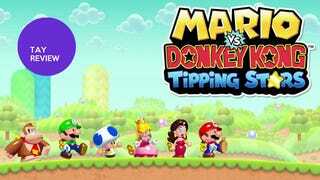 Mario Vs. Donkey Kong: Tipping Stars is not on Pushmo's level. Mario Vs. Donkey Kong: Tipping Stars is a robot, straddling a line where it wants to be a great game but never quite makes it. World One offers you a chipper version of the theme from Super Mario World 2: Yoshi's Island. World Two continues the audio call-backs by exploring music from Donkey Kong Country. I feel like it's fairly typical for Nintendo games to be full of great music and sound quality, and Tipping Stars is no exception. The quality is great and you'll find Nintendo Love© flowing from your speakers/gamepad most moments during and between gameplay. You'll hear the usual Mario hoots and hollers along with some garbled/robotic versions coming from the Minis. I would have been surprised if they missed the mark. The Mario universe has such a library of classic ensembles to choose, all the developers had to do was build on it. It sounds great, but it kind of boils down to the sentiment "What did you really expect?" If this title has anything going for it is content. It comes with 8 worlds in the main campaign, with an addition 3 bonus worlds. Online functionality was not totally available at the time of review, but I would bet that the community is where the best content will be made. The level creator is simple but powerful. So long as you understand the the tools that are given you'll only be limited only by the bounds of the box you can create in (which even then isn't to confining). The tools and enemies you'll use are all in the included levels, and I'd recommend playing through it so you better understand their use. From the little I was able to explore on the community menu finding levels is simple enough. You can search by the most popular or new or even by friends you've registered on your console. On top of the online functionality Nintendo is fostering the sense of community by including the star tipping mechanic, making it easier to show appreciation to users who have created interesting levels. Hopefully sharing between the 3DS and Wii U is everything we've been wanting in cross-console compatibility developers (Nintendo or otherwise) have been promising since the GBA Link days of yore. Tipping Stars isn't the title that it wants to be. It never stretches far enough into the creative or innovative spaces I've come to expect from many of Nintendo's first party titles. Even when it's producing smaller titles for the eShop (a.k.a. Pushmo), or value titles like Captain Toad or Kirby's Rainbow Curse, Nintendo has made it a point to try something new, gameplay or otherwise. Tipping Stars is what happens when Nintendo creates something that just works and nothing really more. It's fine. Enjoyable. It is functional as a video game. But it feels like damning praise to be merely a competent game. You are given a set of tools, up to four different ones per stage, to lead your Minis to an end door. Things like Girders and Pipes must be traversed, many times in a specific order, to lead them safely around enemies and obstacles. The game will score you on the time for completion and the number of coins collected. Collect them all and finish with a good time and you are rewarded with the maximum number of points. Maximum points will net you three stars for the stage. There's no story to be seen. Just the simple gameplay that makes it easy to set up a lot of level varieties and difficulties in the editor without too much effort on the player's part. The game is more or less pleasant. My problem is that most of the time I spent playing I never felt like I was seeing something that hadn't been done before. It was like this uncanny valley, where my mind couldn't decide if I had done this all before or not. For those of you who have played Mini-Land Mayem, the gameplay looks to be exactly the same. The ideas never got to the point where they were used cleverly. When I played Pushmo I became addicted to the cleverness of the designs. It would keep me saying "Just one more, so I can see what it's like". Mario Vs. Donkey Kong: Tipping Stars never made me feel that. I was just as ready to put it down as I was to pick it up. That isn't to say that it doesn't get challenging. Later levels had me retrying a few times, but I never found myself too frustrated. The levels are designed well, and the difficulty curve is pretty much perfect. Just don't expect to be wowed by the stages in the main campaign, even when you get further into the game. I can only hope that it's something the community will remedy with it's infinite creativity. Tipping Stars won't win any awards for most beautiful game either. The graphics, again, get the job done. The animation is smooth and the characters are well done mostly. Much of the aesthetic is just a derivative of the main series New Super Mario Bros. games, especially the backgrounds that could probably be swapped into main series games easily. I had a slight issue with some of the elements looking a bit too much like something you'd find in an online flash game. Doors particularly gave the impression that they were flat in comparison to other elements on the screen. All in all though, the assets and art style are sufficient for what they are trying to do. You'll find unlockable skins for the girders and pipes you'll use, but they are confined to the level creator, as well as the other characters toys that you'll find in the regular campaign. You won't encounter any of the more interesting themes, like the reference to the classic Boo level shown above, unless you are creating your own level or have been playing levels in the online community. Adding the variation is a nice touch in what is otherwise a visually basic game. Is that Worth a Tip? The star tipping mechanic was supposed to be a huge part of the game. So much so that it's part of the title! But despite the namesake you'll find that the only time you'll tip stars is during online play. Tipping users in the community will unlock stamps for use in the game's Miiverse community or for leaving notes on a custom stages for the author. The only use for stars outside of re-tipping online is to unlock a modest amount of unlockable skins and elements for the level editor. After you finish unlocking that content, that's it. It leaves me wanting for a meaningful way to implement the tipping system elsewhere. Maybe Nintendo wasted a the perfectly good title for a game that is pretty much Mini-Land Mayhem 2. As far as we know Nintendo won't be adding more content via DLC to pad out the game later, so there will be a point where re-playability is going to be an issue. Unless you are a content creator with an insatiable appetite for level editors you will find yourself with less and less to accomplish as you move into post-game. The game's namesake is sinking before it get's too much time in the open water. Something I'd have loved to have available is a way to fast forward a level's speed slightly. Too often I found myself waiting an extra five seconds for all of my Minis to get to the exit even though the path was clear and direct. It's just a nitpick, but waiting for those extra seconds between your actions add up got to me after a bit. It seems like a bit of an oversight on Nintendo's part, but maybe it's a conscious design decision and serves a greater purpose than what I'm seeing? Mario Vs. Donkey Kong: Tipping Stars doesn't quite reach the brilliance of other Nintendo titles. It has puzzles and a playing mechanic, but without the "clever" or "inventive" I associate with their other releases. I recommend it if you love puzzles. It's fun if you love puzzles, or if you've enjoyed previous entries in the series. I enjoy puzzles, but I never found the puzzles here creative enough to keep me intrigued. It's a perfectly respectable game. It's a huge step for Nintendo towards something more regarding cross-console connectivity. But as a game: It get's the job done. I'm not sure I could recommend it as enthusiastically as other titles, especially to someone not familiar with the series or puzzle gaming.